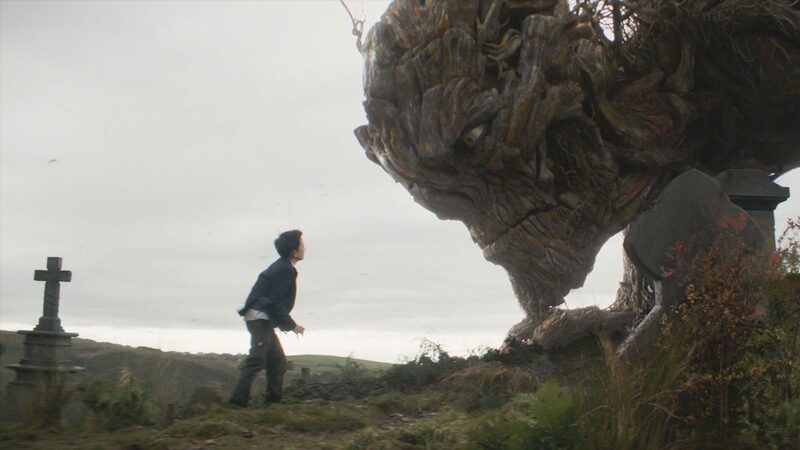 NEW YORK (CNS) — The first thing to know about “A Monster Calls” (Focus) is that, although it’s based on a children’s novel, it’s definitely not for kids. Even many adults will find its mawkish treatment of death and its supply of blithe “answers” to life’s struggles difficult to handle. While the film is probably acceptable for mature and literate adolescents, “mature” is the vital term here. Like all books, Patrick Ness’ award-winning 2011 work can be absorbed slowly, put aside and reflected on. The movie, by contrast, sustains unrelenting horror in the manner of a cult film. The intent of J.A. Bayona, who directed from Ness’ own script, appears to have been to make a faithful adaptation, with mordant observations on the need to accept the inevitability of life’s passages. What the filmmakers ended up with, though, is an uncompromisingly dark melodrama, somewhere beyond gothic. Its protagonist, Conor (Lewis MacDougall), a young adolescent who lives in a British country village, is one very sad and angry boy. There is no respite from his grief. He’s bullied at school and tortured by the knowledge that his divorced mother, Lizzie (Felicity Jones), is slowly dying of cancer. His father (Toby Kebbell) has moved to America and begun a new family. His grandmother (Sigourney Weaver) is emotionally distant, and there are no compassionate adults to guide him through all this. Like his mom, Conor is a skilled artist with an active imagination. He suffers from a vivid recurring nightmare involving a crumbling church and his mother’s plunge into the depths as the cemetery surrounding it becomes a sinkhole. Coming to his “rescue” is a benevolent giant (voice of Liam Neeson) formed from the bark and roots of the graveyard’s ancient yew tree — and with a voice as deep as a coal mine. His centuries of observing human behavior and ability to dispense slightly off-kilter fables are supposed to bring gruff instruction, if not exactly comfort. Initially, this puts the story on a par with benign and occasionally funny tales such as “Pete’s Dragon,” “The Iron Giant” and “The BFG.” But only for a moment. The giant promises Conor that, on successive nights, he’ll tell three stories, after which Conor has to tell him a fourth. The first two, elaborately animated as watercolors, involve a handsome prince who’s not the murderous villain he seems to be and a grouchy medieval apothecary who is far more moral than others might think — especially when compared to the pious clergyman who wants to drive him out of business. The giant never gets to finish his third tale — which begins, “There was once an invisible man who had grown tired of being unseen” — because by now, Conor is in the midst of a destructive emotional breakdown, well past the point at which any form of fantasy might still help him cope. The film contains some physical violence, several discussions of death and intense emotional scenes. The Catholic News Service classification is A-III — adults. The Motion Picture Association of America rating is PG-13 — parents strongly cautioned. Some material may be inappropriate for children under 13.